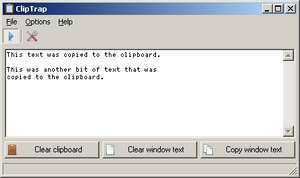 ClipTrap is a freeware clipboard program which watches what changes have been made to the clipboard and logs the data into its own interface. From there, users are able to access older clipboard entries and save them for future reference, or simply recopy them to the clipboard for immediate use. The user interface of the program is pretty easy to understand with copied text appearing in a list. The user configuration includes some customization options including minimize on startup, close to system tray and tab delimiters. Version 1.2.2.1 is a freeware program which does not have restrictions and it's free so it doesn't cost anything. For security reasons, you should also check out the ClipTrap download at LO4D.com which includes virus and malware tests. Additional screenshots of this application download may be available, too. ClipTrap download been highly rated by our users.